This page is intended for sighted developers testing the accessibility of Web pages on a Mac. Information about iPhone commands can be found in external links list. Apple maintains a complete VoiceOver Tutorial for OS X.
Apple’s screen reading utility VoiceOver comes standard with Mac OS X 10.4 and later. The information below is meant to help users begin to use VoiceOver’s functions. For a comprehensive list of VoiceOver’s keyboard commands, as well as guides on getting started with VoiceOver and its newest features, see Apple Accessibility. Note: These commands are optimized for the Safari browser. Some commands may work in other browsers. Press Command + F5 keys to toggle VoiceOver on and off. VoiceOver can be toggled on and off from the Systems Preferences panel in the Accessibility settings. Note: The sequence of Control + Option (Mac keyborard) or Control + Alt (PC keyboard) is called the VoiceOver or "VO" key in other documentation. The "rotor" is a menu window in VoiceOver which presents lists of Web elements such as headings, links, images and other Web elements. It can be configured to add or remove Web page elements as well. 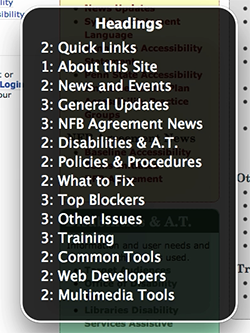 Rotor window showing "Headings" on Accessibility Home page. The first is "2: Quick Links" indicating the presence of an H2 for Quicklinks. Open VoiceOver (Command + F5). Open the VoiceOver Utility by pressing Control + Option + F8. Look for the rotor settings options under the Web tab. Note: The location varies depending on operating system version. Check or uncheck the Web page elements as desired elements. Use arrow key commands to reorder elements into an appropriate sequence order. You can navigate different Web elements without using the rotor with the keyboard commands below. To navigate to previous heading, link, image and so forth, add the Shift key to the command for the "Next" option. These commands allow the user to specify exactly what type of content VoiceOver should read. VoiceOver users can navigate a page via Aria landmarks by choosing Landmarks in the Rotor. A version of VoiceOver is also available for iPhone, iPad and iTouch and is based on finger gestures. More information about VoiceOver on the iPhone is available in the external links list.